Announcing Flutter Beta 1: Build Beautiful Native Apps — The first beta release of Flutter just got announced at Mobile World Congress 2018. It’s Google’s mobile UI framework for crafting native interfaces for both iOS and Android. Welcoming PWAs: Apple Now Supports Service Workers On Safari — With Safari 11.1, Apple will introduce service workers to both macOS and iOS — a crucial ingredient for Progressive Web Apps. 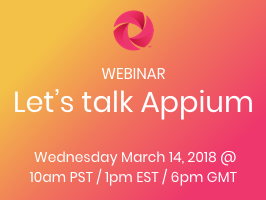 Webinar: Let's Talk Appium — Join us on March 14 for a free webinar featuring some of the world's leading Appium experts, discussing all things Appium, mobile testing, and the upcoming AppiumConf taking place on April 6 in London. Announcing Capacitor 1.0.0 Alpha — A new project from the Ionic folks that aims to offer a better native runtime for Ionic apps in the future across all platforms (including on the Web with PWAs). Xamarin vs React Native vs Ionic: Cross-Platform Mobile Frameworks Comparison — A look at cross platform mobile frameworks, comparing Xamarin, React Native and Ionic. App Developer Salary Guide 2018 — Plenty of statistics on iOS and Android developer salaries and how they compare. How Blind People Use iPhones — Apple engineer Jordyn Castor, attorney Haben Girma, & accessibility consultant Tiffany Taylor demonstrate how accessibility features like VoiceOver allow people to be more independent & efficient. A Comprehensive Guide To UI Design — A guide to finding a solid UI approach that stands the test of time. Optimizing Performance of an Ionic 3 Application — Aimed at starters with Ionic who are thinking about app performance for the first time. Google Announces ARCore 1.0 — ARCore enables devs to build apps that can understand an environment and place objects and information in it. Flutter Crash Course — A video crash course on how to use Flutter to build a complete app from scratch. Mobile Smalltalk — Ever wanted to be able to develop mobile apps for Android and iOS using Smalltalk? Well, either way, now you can! Using WordPress Content in a Native Mobile App — WordPress runs almost 30% of all websites today. Here’s how to re-purpose that content in a cross-platform native mobile app with NativeScript. Integrating Firebase with a Stencil Built PWA — How to integrate Firebase with your Progressive Web App based on Stencil. The Amazing Amount of Backward Compatibility in Google Maps — An interesting look back at Google’s longstanding native app support.